The Akron adjustable gallonage Turbojet nozzle is unmatched in today's fire service for its flexibility and flow control. The Turbojet is a constant gallonage nozzle (flow remains the same in all patterns) with multiple flow settings for operator flow control. Use the Turbojet one time and see why it is the best nozzle in the world. The Single Shutoff SaberJet is a truly multi-purpose nozzle with the penetration of a solid bore tip and the advantages of a fog pattern. This versatile nozzle is well suited for multiple applications. The Single Shutoff SaberJet has a unique three position handle and ball to give you a solid bore, fog, or closed position. The Mercury Monitors are the newest innovation in firefighting equipment. These monitors are smaller than any other ground portable firefighting monitor so they can be quickly set up and left unmanned at the fire scene to free up personnel. The StreamMaster Monitor has uniquely designed, low profile 4'' waterway with cast-in turning vanes. When coupled with an 80 psi nozzle, the pump can operate at lower pressures for flows up to 2000 gpm (7600 lpm). Now you can have the best of both worlds in a handline nozzle. The UltraJet nozzle is all-in-one, combining both smooth bore and fog patterns. This nozzle has simple operations with no additional training required. Available with 1" (25 mm), 15/16" (24 mm), 7/8" (22 mm) or 3/4" (19 mm) tips. Fixed-flow Chief™ nozzles efficiently deliver a constant gallonage from straight stream to full fog. The simple, rugged design makes the Chief™ easy to use and train with and reliable in tough situations. Superior hydraulics, due to a fully machined waterway, result in excellent stream quality and reach. Fixed-flow Chief™ nozzles efficiently deliver a constant gallonage from straight stream to full fog. The simple, rugged design makes the Chief™ easy to use and train with and reliable in tough situations. Looking for a nozzle line designed for CAF application that is durable, dependable and, best of all, simple to use? You found it. The Flex Attack™ from Elkhart Brass. Elkhart quality and Elkhart innovation have been combined to create a nozzle line designed specifically for the changing needs of CAF application in the field - the Flex Attack™ line. With a single effortless click, you can select from Dry CAF, Wet CAF, or a hard hitting 15/16th smooth bore. Or, to flow water only, you can easily select a 15/16th, 1 1/8th, or 1 3/8th smooth bore - without shutting down. The selectable gallonage Phantom® nozzle lets the firefighter select the appropriate flow. The wide selection range standard with the Phantom® makes it one nozzle for every use, from brush to interior attack. The Phantom® is designed for reliable performance with rugged metal selector ring and dual drive metal ball shut-off. R.A.M. is easily deployed and operated by a single firefighter. Its patent-pending hydraulic stability system harnesses reaction force to stabilize the monitor. Four fold-out forged aluminum legs with carbide-tipped ground spikes extend to the largest footprint in its class for exceptional stability. The rear ground spikes are angled to help the carbide tips grip the ground surface. The R.A.M. can be carried while attached to a charged line. Self-Educting master stream nozzles turn any monitor into a foam station without the use of additional equipment and have been part of Elkhart’s fire suppression arsenal for over 20 years. Under 9” wide and requiring just 16” of clearance, the Sidewinder is compact and perfect for wildland, dust abatement, small apparatus use or anywhere space is at a premium. Designed specifically for the rigors of wildland and construction use, Elkhart’s Sidewinder features a 2” fully-vaned waterway, customizable nozzle selection, fast-action tiller control and double-ball races with stainless steel bearings. Stinger® 2.0 is a dual purpose break-apart monitor for use as a deck gun or portable monitor. Numerous truck adapter and portable base options are available to suit every need. In portable mode, five forged aluminum legs with self-adjusting, carbide-tipped ground spikes to increase stability. 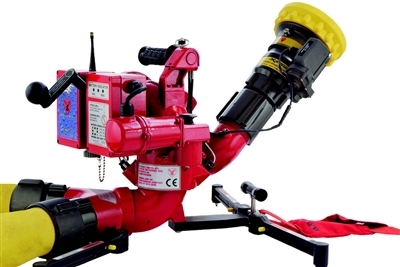 Stinger® RF is a dual purpose break-apart monitor for use as a deck gun or portable monitor. The wireless RF increases effective use of personnel while reducing the potential risk of injury. This monitor can be remotely operated from up to ¼ mile away - in either deck gun or portable mode - with hand-held transmitter. X-Stream® nozzles automatically adjust to maintain effective stream and maximum reach at variable or reduced flows. It is calibrated at lower pressures - for better suitability to real world conditions. Flow range up to 500 gpm (2000 l/min). The monitor features low friction inlet and outlet pivots. Elevation is manually adjustable between 10 and 50 degrees above horizontal. The water driven turbine makes the nozzle automatically sweep 10, 15, or 20 degrees either side of center. The oscillating mechanism can be disengaged and horizontal rotation moved manually. SAFE-TAK 1250 PORTABLE BASE WITH SAFE-TAK VALVE is supplied with either two clappered swivel inlets or with a single full-time swivel inlet. The stainless steel, carbide-tipped base support legs can be folded to easily fit inside a small apparatus compartment, or for carrying pre-connected to a hose line. Includes a safety tie-down strap with attached storage cap. Automatic pressure control with a flow capacity of 95-300 gpm (360-1150 l/min). Includes flush without shutting down, patented slide-type valve for turbulence-free operator flow control, six detent flow positions, molded rubber teeth for full-fill "power fog", and "Gasket Grabber" inlet screen. Pistol grip is mounted below the valve (HD-VPGI), or behind the valve (HD-VPG). Automatic 100 psi (7 bar) pressure control with a flow capacity of 95-300 gpm (360-1150 l/min). Includes flush without shutting down, patented slide-type valve for turbulence-free flow control, six detent flow positions, molded rubber teeth for full-fill "power fog", and "Gasket Grabber" inlet screen. Pistol grip is mounted below the valve (H-2VPGI) or behind the valve (H-2VPG). Fixed gallonage nozzle with 14 flow and pressure choices. Includes flush without shutting down, patented slide-type valve for turbulence-free flow control, six detent flow positions, and "Gasket Grabber" inlet screen. Lightweight hardcoat anodized aluminum for maximum resistance to corrosion and wear. Pistol grip is mounted below the valve. 1.5" NH (38mm) full-time swivel rocker lug coupling is standard. Automatic pressure control with a flow capacity of 70-200 gpm (260-760 l/min). Includes flush without shutting down, patented slide-type valve for turbulence-free flow control, six detent flow positions, and "Gasket Grabber" inlet screen. Lightweight hardcoat anodized aluminum for maximum resistance to corrosion and wear. Selectable gallonage nozzle with four flow settings of 30, 60, 95, and 125 gpm @ 100 psi (110-230-360-470 l/min @ 7bar). All lightweight materials, hardcoat anodized aluminum. Flush without shutting down. Quick-change rear valve seat and stainless steel shut-off ball. Pistol grip is mounted below the valve. Rocker lug 1.5" NPSH swivel is standard. Selectable gallonage nozzle with six flow settings of 30, 60, 95, 125, 150, and 200 gpm @ 100 psi (110-230-360-470-570-750 l/min @ 7 bar). All lightweight materials, hardcoat anodized aluminum. Flush without shutting down. Quick-change rear valve seat and stainless steel shut-off ball. Pistol grip is mounted below the valve. Rocker lug 1.5" NPSH full-time swivel coupling is standard.